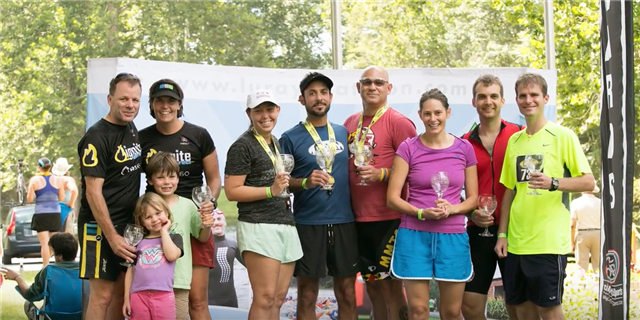 We thank our loyal fans of the Luray Triathlon, those who continue to come back year after year and encourage others to join them. 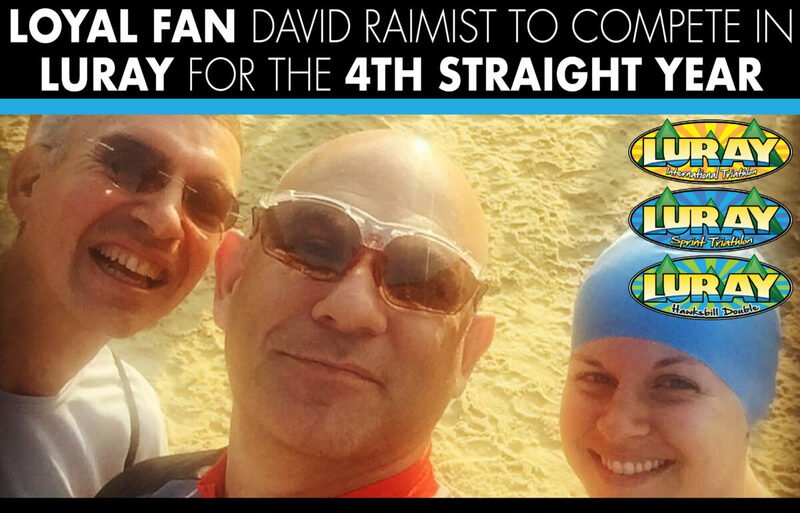 Recently we caught up with one of those loyal fans, David Raimist. 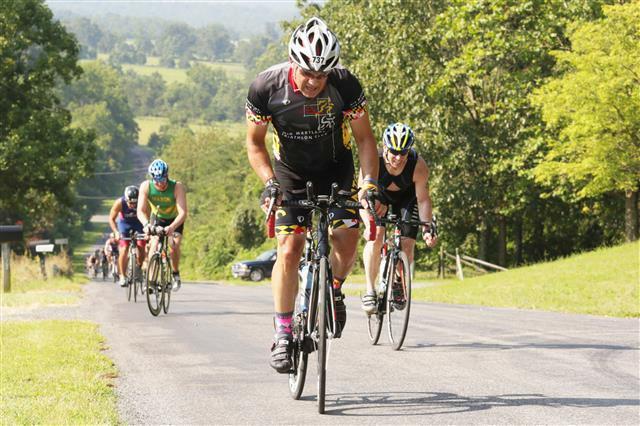 David will be competing this year in the Luray Triathlon for his 4th year in a row. An avid cyclist and member of the Mid-Maryland Tri Club, David puts together a competitive relay team each year. A: I grew up in South Jersey and consider myself more of a “Philly” kid than a New Jersey kid. Graduated from James Madison University in 1985. I have been married for 30 years and have two children who are 22 and 18 years old. I currently work at The Heart Rhythm Society in Washington DC where I am the Director, Digital Technology and Data Analytics. I currently live in Frederick County MD and have lived there for 28 years. I am very active with the Greater DC-Maryland Chapter of the National Multiple Sclerosis Society and have been for 10 years. I have been a Bike MS Team Captain and also participate on several committees. Bike MS was the impetus for me to get into biking and raising money and awareness for MS is a passion of mine. My teams have raised more the $300,000 and am looking forward to finding a cure! Q: How did you find out about the Luray Triathlon? A: I actually heard about the Luray Triathlon several months prior to the 2014 Triathlon. I was at our monthly Mid-Maryland Tri Club (MMTC) meeting and another member and I were talking about the free entry that he had won at an event, but couldn’t make it. He asked if I was interested. I checked to make sure that I could use it for a relay team and put together a team shortly after. I have been hooked on this event ever since. Q: What made you decide to do the relay? A: I assume you mean instead of doing it as an individual? That’s an easy one — I don’t swim or run! Q: Have you ever done the relay before Luray? A: Yes. I had done a full Ironman distance relay as well as an Olympic Duathlon relay prior to Luray. Q: How do you pick your relay team for Luray? A: Friends, fellow athletes and colleagues. I am competitive so I try to put together teams that will be fun but who are also of a competitive mind set. Q: Have you been on the podium if so how many times? A: Each of the previous 3 years my Mixed Relay team has been on the podium. I have had some competitive teams and teammates. Q: What is your best finish? Q: What is your favorite thing about the Luray Triathlon? A: Slam dunk — the venue! It is absolutely gorgeous in Luray and the surrounding area. The bike course is really nice and provides some nice challenges. Ken and his team put on a top-notch event. Q: What is your favorite memory from a past Luray Triathlon? A: I really don’t have a single favorite memory. I enjoy the weekend with friends, the energy and excitement of race weekend and the tri-community. While I only do the bike leg in a relay, I have always been welcomed by these amazing athletes. If I had to pick one, it would be the race announcer acknowledging every finisher, including those coming into the finishing chute during the award ceremony – so inspiring! Q: What do you think about the town of Luray or the area? A: The area is gorgeous. I went to school in Harrisonburg at JMU and never made it to Luray during those years. I wish I had. I enjoy visiting the area and have done a few other bike rides in and around the Luray area.